– in Edgefield and Greenwood Counties. 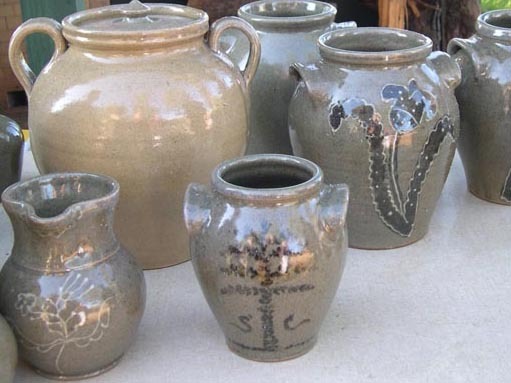 Local potters in the Greenwood and Edgefield area are collaborating to host the first Heritage Trail Pottery Tour & Sale, a series of events from Friday, May 4 through Sunday, May 6. The Pottery Tour & Sale kicks off with joint receptions at The Museum in Greenwood and the Discovery Center in Edgefield during which the public will have the opportunity to meet participating potters and view samples of their work. The weekend events also include pottery demonstrations and kiln openings at seven host studios with over 25 potters selling their recent work. The tour is a joint effort of the Greenwood Area Studio Potters (GASP) and the Edgefield Area Clay Guild (EACG). Both groups were formed by current and former students of the professional pottery program at the Edgefield campus of Piedmont Technical College. The guilds created the tour as a response to increased community interest in pottery and also to provide a chance to “gain a greater understanding of the craft, to be able to purchase one-of-a-kind pieces and to also educate our communities about the outstanding pottery heritage in this area” said GASP President Dohnna Boyajian. The pottery community, especially in Edgefield, has been evolving for over 200 years. According to local research, Edgefield’s first pottery was called Pottersville and was started by Abner Landrum in the early 1800s. Pottersville is currently listed on the National Register of Historic Properties. The Groundhog kiln, similar to those of Pottersville, was recently constructed in Edgefield and will be opened during the Heritage Trail Pottery Tour & Sale on Saturday, May 5 at 10 a.m. Members of the Edgefield Historical Society as well as potters will be on hand to discuss the kiln and the heritage of pottery in and around Edgefield. All activities during the Heritage Trail Pottery Tour & Sale are free of charge and are meant to provide a variety of options for the public to pick and choose from. For a detailed schedule of events or to receive the official Heritage Trail Pottery Tour brochure visit www.facebook.com/HeritageTrailPotteryTourSale or email bellhousepottery@gmail.com. Greenwood and Edgefield counties are both located along the SC National Heritage Corridor. One Response to "Heritage Trail Pottery Tour & Sale"